At Happitude we believe that a place is defined not only by its location but also by the emotions and feelings that it inspires in the people who visit there. Whether it is a favorite performance place, an awe inspiring view, the location of a peak experience or simply fond memories, the common thread is a feeling of happiness. With our novel approach, technology (GPS Coordinates) meets emotion in a design that lets the wearer feel as though they are a part of a community that truly understands the essence of a place. This is why we call the point where longitude, latitude and happiness connect “Happitude”. 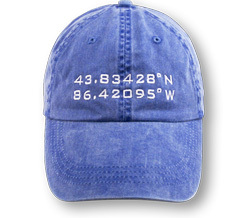 Our GPS hats (and momentarily, t-shirts) serve as a reference point for the memories created there. So where’s your hat? The Original And Authentic GPS Hat. Click Here To Order! A reminder of what is most important.